Need some new ideas for Elf on the Shelf this year? I’ve got fun and free printable Elf on the Shelf Scavenger Hunt clues that will work for any home! 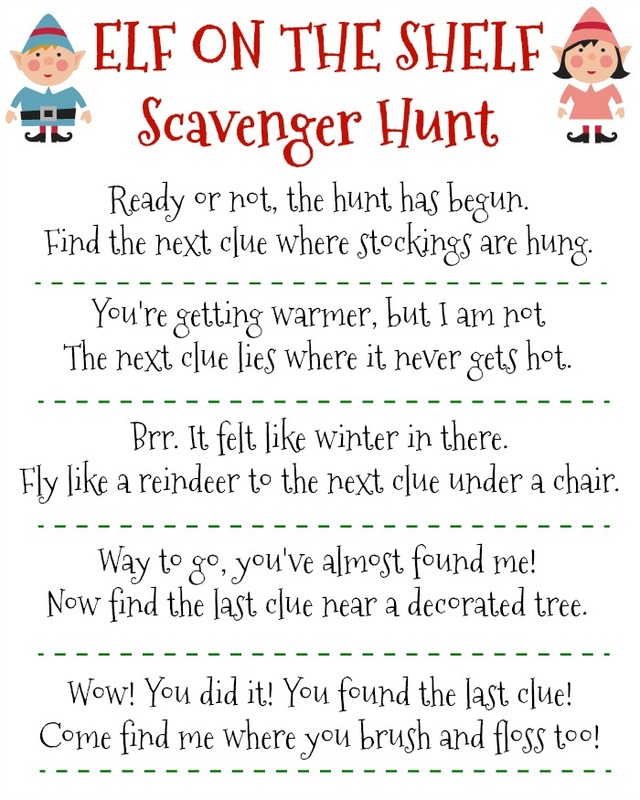 We love scavenger hunts, especially for the holidays, and it makes for a quick Elf on the Shelf idea. Not only can you simply hide the elf without doing anything more than cutting and hiding clues, but your child will have fun running around the house hunting down the elf! This Elf on the Shelf Scavenger Hunt leads your kids to where the stockings are hung, the freezer, under any chair, to the Christmas tree, and finally to the bathroom where they will find their elf. I would suggest hiding Elf on the Shelf well in the bathroom, just in case your child has to run in there before they finish up the clues. The first clue can be laid right where they will see it when they wake up if you want to prevent them from finding him or her before the hunt begins. Cute! Thank you. My son has been BEGGING for the elf to do a scavenger hunt.